December, 24th 2012, Rybinsk – In 2012 NPO Saturn NPO Saturn strictly followed the adopted budget demonstrating the high level of performance and quality indicators which characterized the robustness of the Company’s production system. In 2012 NPO Saturn is expecting its production volume to be around 13,4 billion rubles. The Company has demonstrated considerable year-on-year growth in the volume of production – by over 40 % which is a substantial factor of growth and development for Saturn as a company. NPO Saturn forecasts its sales revenue to amount to 13,3 billion rubles in 2012. Compared to 2011 the Company has been able to increase its sales revenue by 26,5 %. The “I choose Saturn” advertising campaign launched in 2012 was backed up by the further development of the Company’s social-responsibility programs: increased salary, support of the athletic and youth-oriented movements, the one-off benefit payments, a discount program, new large-scale housing construction projects among which is the started construction of a housing district including a recreation center for the Company’s employees. 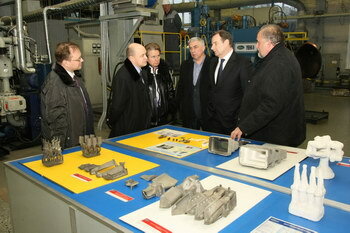 On December, 11th 2012 a delegation from NPO Saturn headed by the company’s CEO Ilya Fedorov visited the all-Russian research institute for aviation materials (VIAM). In the course of the visit the guests were shown the Institute’s research, production and test facilities, the laboratories, the certified small-capacity production areas as well as the Research center for high-gradient single-crystal blade casting process. November, 28th 2012, Rybinsk – By the resolution of the organizing committee of the International forum “International experience and Russia’s economy” the contribution of NPO Saturn to environmental activity has been recognized by the Honorary diploma “The leader of the environmental activity in Russia – 2012” and by the order “The ecological shield of Russia”. Mr. Vladimir Kochin, deputy head of the NPO Saturn workshop №4 was awarded an Honorary medal “For environmental safety” for his input in the improvement of the company’s environmental safety and the environment-oriented upgrade of the production facilities. On 15 November 2012 in the frame of the “Metal-Expo 2012” international exhibition NPO Saturn, a Russian aircraft engine manufacturer and The Ural Forge, a Russian metallurgic company, part of the Mechel company, signed a long-term agreement for supply of forged and pressed rough parts spanning the period of 2013 – 2015. The overall sales volume under the said agreement will amount to around 400 tons over a three-year time period. In the frame of the International indusrial exhibition “Metal-Expo 2102”, a Russian metallurgical company SMK and a Russian aircraft engine manufacturer NPO Saturn signed a long-term agreement (slated for the period from 2013 to 2015) for supply of refractory components. The overall agreement revenue will amount to approximately two billion rubles over a three-year time period.